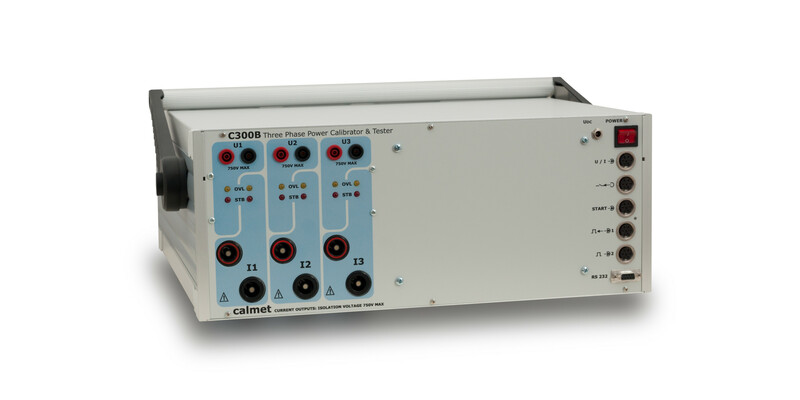 The C300B three-phase power calibrator and tester is used for the adjusting, checking and verification of measuring instruments such as; electricity meters, frequency, voltage and current protective relays, current transformers and clamps, active and reactive power meters, phase meters, frequency meters, ammeters, voltmeters, transducers, monitoring systems and power quality analyzers. The C300B is a single/three phase source of AC current and voltage with an accuracy class of 0.02 or 0.05, and programmable values for harmonics. It generates voltages up to 560V in sub-ranges 70V, 140V, 280V, and 560V. Current is available up to 120A in sub-ranges 0.5A, 6A, 20A, and 120A. Frequency ranges from 40Hz to 500Hz, and phase angle from 0 to 360°. In a single phase connection it can generate current up to 360A. The C300B can automatically obtain the error characteristics for measurement values and time characteristics of protection relays electricity meters, standard S0 impulse input is used with the possibility of a photo scanning head connection. When testing transducers, current transformers and clamps, a DC input with ranges 10V/20mA and an AC input with ranges 10V/100mA/5A is used. For protective relay testing, three timers with start/stop inputs and resolution 1ms are utilized. Two additional binary outputs are used for operate/standby calibrator state signaling. The calibrator is controlled by means of a personal computer running a Windows operating system with Calpro 300 software installed.